No other British dish shows the British idiosyncrasy of calling a savory dish a pudding than a steak and kidney pudding. It is not a pudding in the dessert sense of the word, but a pudding in the old-British way of talking about food. This recipe may at first look a little daunting, but don’t be put off, it is straightforward, and all the effort well worth it as the pudding makes a fabulous lunch or dinner and is considered one of the kings of British comfort foods. Perfect on a cold winter's day. The wine is not traditional, but it enriches the gravy and adds depth to the whole dish. Do not confuse this with a steak and kidney pie; this is something entirely different. 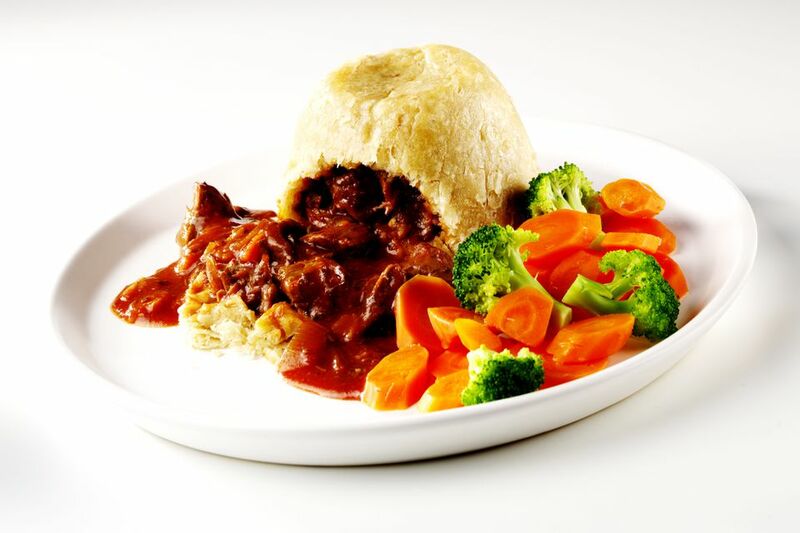 Beware, steak and kidney pudding is a very filling dish, but it is lovely with mashed potatoes to soak up the delicious sauce and fresh seasonal vegetables. Preheat the oven to 350 F/180 C. Heat a large casserole dish on the stove, add the drippings/lard or oil and heat until slightly smoking. Add the beef cubes and the kidney, stir well until all the meat is browned. Add the onion, carrots, and stir again. Add the stock, red wine, bay leaf, parsley, and tomato puree. Bring to a gentle boil, then reduce the heat and cover with a lid. Place in the hot oven and cook for 1 hour. Remove the casserole from the oven, season with salt and pepper to taste, and leave it to cool. Make the pastry. Place the flour, baking powder, and salt into a baking bowl. Add the suet and rub into the flour. Add enough cold water to form a stiff, slightly sticky dough. Leave it to rest for 30 minutes. Grease a 2-pint pudding basin with the butter. Divide the pastry into 2/3 and 1/3 parts and roll the larger piece of dough into a circle large enough to line the basin with an extra 1/2" border. Dust your hands with a little flour then carefully line the basin with the dough. Add the meat mixture and roll the remaining dough into a circle large enough to make a lid. Wet the overhanging lip of the basin with cold water, lay the lid on top and press firmly around the edge to seal. Steam over rapidly boiling water for 2 hours. Check frequently to make sure water has not boiled dry. Top up with boiling water as needed. Remove the pudding from the steamer, remove the greaseproof paper, and serve.